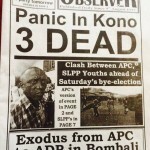 HIS name is Jonathan Leigh, Managing Editor, Independent Observer newspaper in Freetown, Sierra Leone. 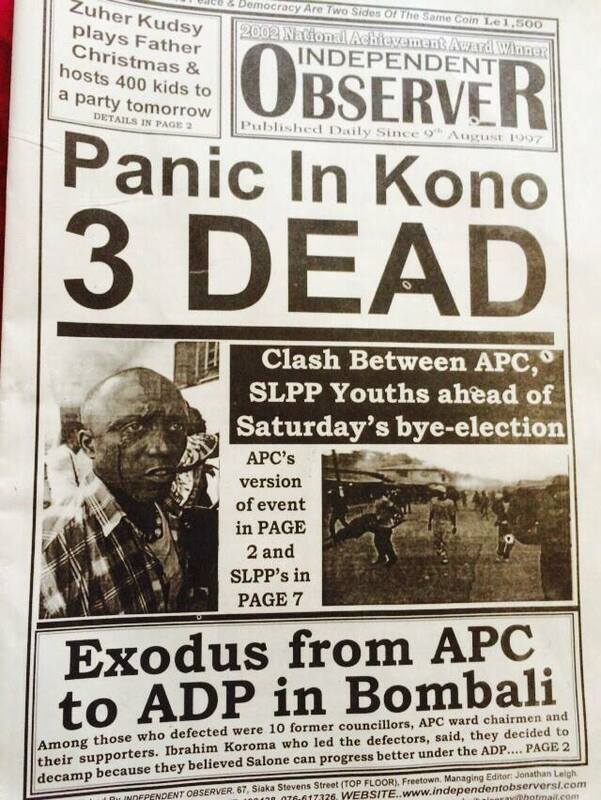 He authored a cover story titled: “Panic in Kono: 3 dead”. The story caused stir in the police hierarchy in Sierra Leone and a warrant of arrest was issued for Jonathan. He was arrested, locked up in cell, denied access to Attorney and medication. That is an oppression of press freedom and violation of basic human rights to freedom, expression and liberty as stated in Section 1, 3, 5, 13, 1 and 15 of Universal Declaration of Human Rights (UDHR) 1948. He has to be charged to court and giving access to his lawyers, medication and family members. The Committee to Protect Journalists calls on authorities in Sierra Leone to release Jonathan Leigh, managing editor of the Independent Observer. Leigh was arrested Thursday on accusations of publishing false information, according to news reports and local journalists with whom CPJ spoke. Bai-Bai Sesay, editor of the daily Independent Observer, told CPJ Leigh is accused of publishing false information over a front-page article published Thursday under the headline: “Panic in Kono: 3 dead.” The article was about reports of political violence ahead of local by-elections taking place Saturday, Umaru Fofana, a correspondent for the BBC and Reuters, told CPJ. Sesay told CPJ four police officers from the Criminal Investigations Department arrested Leigh at the newspaper’s office in the capital, Freetown. The police said Leigh was invited to their offices for clarification about the story, Fofana posted on Facebook. Fofana told CPJ the article that led to Leigh’s arrest included two press releases that gave the positions of the ruling and opposition parties about political violence. Kelvin Lewis, the president of the Sierra Leone Association of Journalists, told CPJ, the association met with Francis Munu, the inspector general of police, today, who told them Leigh was denied bail and that the editor would spend the weekend in jail before being officially charged in court Monday for false publication under the 1965 Public Order Act. Under the act, anyone found guilty of publishing false news can be fined and handed a prison sentence of up to two years. Leigh has been arrested previously for his paper’s political coverage. In October 2013 CPJ reported how he was held on charges of sedition and libel over a story criticizing President Ernest Bai Koroma.